Over many years of talking to priests, especially at our annual Priest Conferences, we get to know our spiritual fathers. 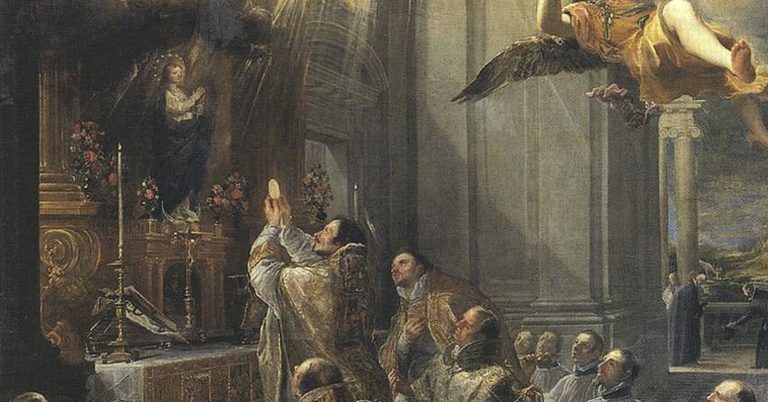 One thing priests consistently say they desire is stronger formation in Scripture. Whether we’re talking at one of our priest conferences or discussing one of our academic resources, Scripture always comes up. Maybe it’s because we just love to talk about Scripture, or because priests know our mission is to help Catholics read the Bible from the heart of the Church. But we think, more than that, it’s because when you ask a priest what he wants to grow in, it’s knowledge of Scripture. Think about it—if you only ever saw a priest at Sunday Mass, you’d know him for two things: consecrating the Eucharist, and preaching on Scripture. Knowledge of Scripture is essential to the Catholic priesthood. With this in mind, we’ve worked to make this the primary focus of our annual Priest Conferences. We don’t just offer a few talks on Scripture, we bring in the world’s best Catholic Scripture scholars—like Scott Hahn, John Bergsma, Brant Pitre, and Tim Gray—to offer the highest level of Scripture scholarship. And it is always scholarship that holds firm to the truth. Our priests never have to worry about the orthodoxy of our conferences. We pride ourselves on our faithfulness to the Magisterium and we hold it an honor to work for the good of the Church. Our mission to read the Bible from the heart of the Church informs all our outreaches, but most especially our outreach to priests, who are at the forefront of biblical catechesis and who are hungry for this kind of formation. Another focus of our conferences is also the fruit of many conversations with priests. It’s something that the laity might not think about, but that is so necessary for all men in the priesthood. And that’s solid friendship with brother priests. Catholic fellowship is something we all desire, whether we’re laity or in religious life. Priests need this fellowship just as much if not more than the parishioners they serve. They want time to share the common experiences that other priests understand. Our conferences offer time for growing in priestly brotherhood through shared meals and ample free time. At the end of the day, after plenty of time for prayer and study, priests get to relax with a drink and talk with friends, and priests who attend our conferences often cite this brotherly fellowship as one of the most blessed parts of the retreat. There are a lot of options out there for priest retreats and conferences, but the St. Paul Center Priest Conferences are some of the best in the world. They’re unique in their focus on Scripture and the world-class formation they provide. And they’re one of the only retreats designed specifically for priests alone, which fosters community and strengthens friendships that last long after the retreat ends. You can give your priest an incredible gift for Easter. Register him for one of the St. Paul Center’s world-class Priest Conferences. The 2019 East Coast Priest Conference will be held this summer, July 15–18, at Oglebay Resort and Conference Center in Wheeling, West Virginia. The 2020 West Coast Priest Conference will be held January 6–9 at the Estancia La Jolla Hotel & Spa in La Jolla, California. Both conferences feature the same respected scholars and the same balance of study, prayer, and leisure. Whichever conference fits best into your priest’s schedule, it’s sure to be a time of great personal and spiritual blessing.